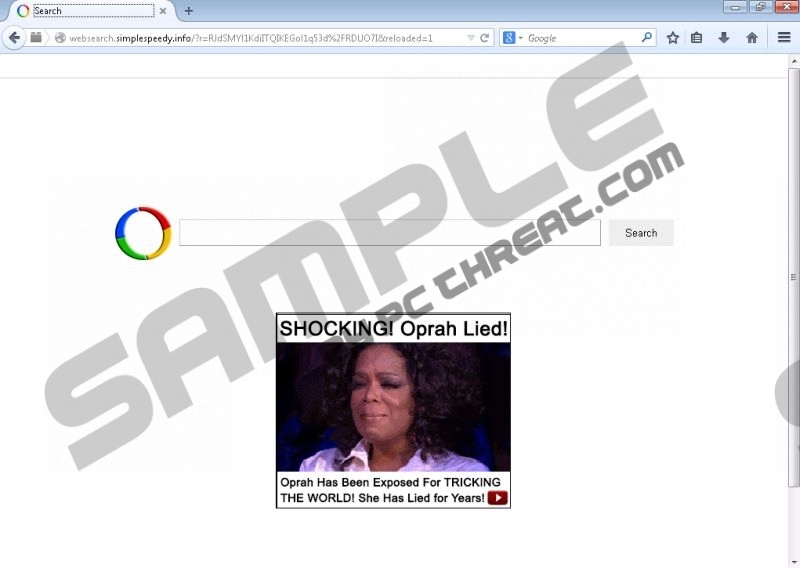 Websearch.simplespeedy.info is classified as a browser hijacker. Hijackers are known to get on people’s computers and change their browser settings, causing annoyance to computer users, when they try to go about their daily browsing activities with a different homepage than they are used to and a new search engine. Different from applications that ask for permission before changing these browser settings, hijackers do not care for it at all. Keeping in mind that our security researchers recommend removing the applications which ask for permission, hijackers are a no brainer. You should always delete them from your web browser as soon as possible. Identical to hijackers like Websearch.search-guide.info, Websearch.homesearch-hub.info, or Websearch.search-plaza.info, Websearch.simplespeedy.info works with all three major Internet browsers, changing their homepage and default search engine upon infection. Both the homepage and search engine are incredibly similar-looking to Google, with one major difference. Websearch.simplespeedy.info displays advertisements. Clicking on them could be a perilous thing to do, we strongly caution against it. These ads link to third-party websites that could contain threats to your computer’s safety. Websearch.simplespeedy.info is distributed through setup wizards that offer to install several different applications. If you do not pay attention while setting up these programs, you will leave some checked boxes offering to install programs you do not want, like Websearch.simplespeedy.info. The setup wizard will interpret this as agreement and install them all. The most popular Websearch.simplespeedy.info installers are known to be found after clicking fake Java or Flash update links on file-sharing and piracy websites. Everyone knows that you should not trust anything that is distributed on illegal download websites, so it is a great idea to remove Websearch.simplespeedy.info from your system, going back to your usual Internet browsing practices as a result. An average computer user should be capable enough with computers to remove Websearch.simplespeedy.info from his or her system by hand; however, it is never wrong to ask for help. Fortunately, we will provide detailed instructions for Websearch.simplespeedy.info removal below this article. We have to point out that our instructions will only help you delete this threat alone. If you want to ensure complete system security, you should know that there are professional antispyware programs that can remove all threats while you can only manually take care of one threat at a time. Ultimately, it is you, who must choose the best way to ensure your system’s security. Click Search Providers and choose your favorite search provider as default. Remove Websearch.youwillfind.info from the list and press Alt+T again. Go to Internet Options then click the General tab. Delete your homepage URL, set your new homepage, and click OK. Enter chrome://settings in your address bar and press Enter. Go to On Startup, select Open a specific page or set pages, and click Set pages. Delete Websearch.youwillfind.info and click OK, then find the Appearance section. Check the Show Home button box and click Change. Delete Websearch.youwillfind.info, click OK, and go to the Search section. Find your favorite search engine and click Make default next to its name. Delete Websearch.youwillfind.info by clicking X and confirm by clicking Done. Press Alt+T, go to Options, and click the General tab. Delete the homepage URL, change it to the one you prefer, and click OK.
Click the small triangle next to your search provider icon in the search box. Click Manage search engines, remove Websearch.youwillfind.info, and click OK.
Quick & tested solution for websearch.simplespeedy.info removal.